Whittle-le-Woods CE Primary School is a loving, caring and an inclusive place to learn. A place where we always expect the best of each other and care for each other. We have a vibrant on-line community which you can find on Facebook- click the button at the bottom of this page. We are a Church of England School in foundation with St John the Evangelist and Clayton Brook Church. Our admission criteria result in pupils in our school having connections to a number of churches, some from different faith backgrounds and a large proportion with no faith background at all. We were judged to be OUTSTANDING in all areas. 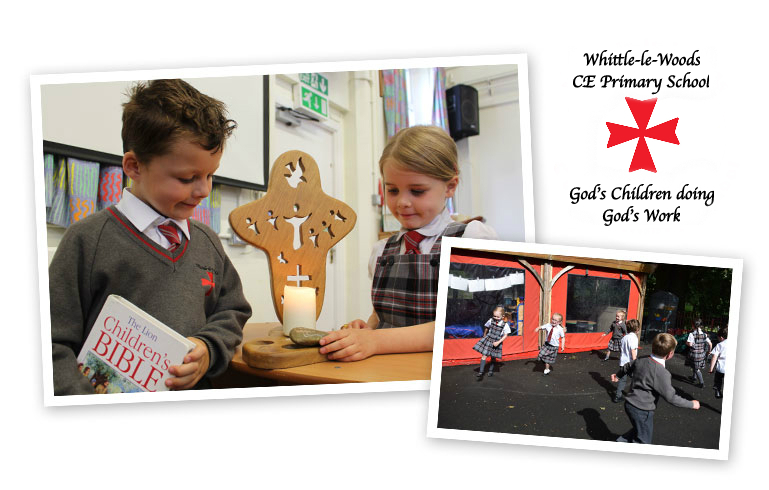 We are together in our Christian family – a learning community where everyone is respected, valued, nurtured and challenged within a high-quality, creative and safe environment. We provide guidance and time so each individual may grow academically, spiritually, physically, emotionally and socially. We celebrate the place of primary education as a fundamental part of the learning journey. We ensure an exciting, challenging and rigorous curriculum is taught and learned. Educating is our highest priority so individual potential may be realised. We work together, within God’s love, children, staff, parents, carers, governors, Church and Community. We are God’s children doing God’s work. know that they can have an impact on the world and the confidence to make it happen. Each half term we focus on one of our Christian Values. The teaching of these values is based on Bible teaching and all our work regarding these is ‘Rooted in Christ’. Our school comes under the Parish of St. John the Evangelist which is situated just next door to our school. This allows our pupils to easily take part in various services throughout the year, including a Harvest Festival service, Education Sunday Service and a Carols by Candlelight Service at Christmas. Reverend Philip Venables and other members of the lay clergy visit the school to lead worship for the whole school each Wednesday morning and often visit school to enhance our learning in a range of topic. We admit pupils from a number of different churches from surrounding areas as our admission criteria do not specify any one church. We also admit and welcome pupils from a variety of faith and non faith backgrounds into our school family.